This is Book 5 of the Survivors’ Club series—after The Proposal (Hugo’s story), The Arrangement(Vincent’s), The Escape (Ben’s), and Only Enchanting (Flavian’s). This is Ralph Stockwood, Earl of Berwick’s story—and Chloe Muirhead’s. Ralph had once spent three years at Penderris Hall in Cornwall, along with the other six members of the Survivors’ Club, recuperating from wounds sustained during the Napoleonic Wars. He was brought home from Portugal with terrible physical wounds that have left ugly scars, but worst of all, because most difficult to heal, he suffers from the guilt of having persuaded his three best friends to go to war with him only to face the horror of watching them die in the cavalry charge that almost killed him. Life must go on, however. He is heir to a dukedom, and his grandfather is ailing. 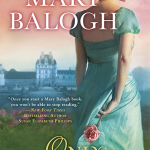 Both his grandparents’ are urging him to marry and beget heirs, and Ralph loves them enough to recognize his responsibility to them and his position. Reluctantly he promises to choose a wife during the current social Season in London. During two separate years Chloe Muirhead had been to London to participate in the social activities of the Season. Both times she had hoped to find a husband. On both occasions, however, terrible scandal sent her running home to the country. Now she is convinced that she can hold out no further hope of marriage and motherhood and happiness. And such was the second scandal that she no longer finds it possible to continue living at home with her father and sister. She has taken refuge at the home of her late mother’s elderly godmother—and Ralph’s grandmother. When Chloe meets Ralph there, she is prepared to dislike him as she remembers that he had been unkind to her brother both when they were at school together and after Ralph was brought home, terribly wounded. 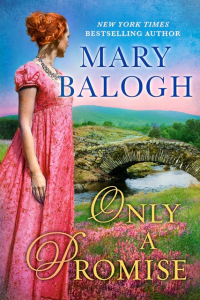 When she realizes, however, that Ralph needs a wife but has little interest in going to London to choose one, she concocts a desperate scheme to satisfy her own desire for a husband and his urgent need for a wife. It seems a straightforward enough bargain that she suggests to Ralph. She asks only one favor of him: his promise that she need never again go to London. 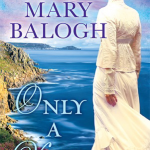 It is the one promise, however, that Ralph soon finds it impossible to keep. Borne down by burdens from the past and betrayals in the present, Ralph and Chloe’s marriage seems doomed almost from the start. Only the one factor they did not consider as part of their bargain can offer them any chance for happiness…and that is love. Ralph Stockwood, Earl of Berwick, has obeyed a summons to his grandparent’s home. After his arrival his grandmother had confided her fears for his grandfather’s health, and Ralph had promised that he would return to London and look about him in earnest for a wife. At the same time he had made clear the fact that he did not expect either love or happiness from marriage. Chloe Muirhead had been present in the room as they talked, but Ralph had scarcely noticed her. She was not literally his grandmother’s paid companion, but she behaved rather like one. Now, the following morning, Ralph steps outside to think over what is facing him. There was no sign of either of his grandparents. He had not expected there would be. He was not hungry. He would wait for them. In the meanwhile, he wandered into the morning room, which was flooded with sunshine, facing east as it was. He found the French windows already unlocked and ajar, a fact that ought to have alerted him. He pulled one of them open, stepped through onto the terrace, and stood looking across the freshly scythed expanse of the east lawn to the river in the middle distance. He drew in a deep breath of fresh air and released it slowly. He had not slept well. He had kept waking himself up from dreams that were not exactly nightmares but were bizarre nonetheless. He could remember only one of them, one of the more coherent. He had been in a ballroom he did not recognize, a room so long that even with a telescope he would not have been able to see the far end of it. Along its full length, stretching to infinity, was a line of young ladies, all dressed in ballroom finery, and all of them plying a fan, though they were otherwise motionless. And he was marching with slow deliberation along the line, clad in his scarlet, gold-faced officer’s dress uniform, inspecting them, his mother on one side, Graham Muirhead in full clerical robes on the other. It was not one of those dreams that defied interpretation, though why Muirhead of all people should have popped into it he could not imagine. Ah, and then he could. He became suddenly aware of a flutter of movement off to his right and turned his head sharply to see Miss Muirhead standing a short distance away, bonnetless and clutching the corners of a shawl to her bosom, presumably to prevent it from blowing away in the non-existent wind. He felt instant irritation. She had overheard that very personal conversation he had had with his grandmother last evening and had not had the decency either to clear her throat to remind them of her presence or to leave the room. He had been quite unaware of her, as one tended to be unaware of servants. Though she was not a servant, was she? She was a guest of his grandmother’s—one who ran and fetched for her and effaced herself in a most unguestlike manner. A woman seemingly without character or personality or conversation. Was she related to Graham Muirhead by any chance? It was not a common name—Muirhead. His irritation only increased at the possibility that there was a connection. “Good morning.” He inclined his head curtly to her and stepped off the terrace in order to stroll out across the lawn where he could be alone again. “My lord,” he heard her murmur. What he must do now, he decided as he approached an old oak tree and set a hand upon its sturdy, familiar trunk, was spend as much of today as he could with his grandfather and then return to town tomorrow. He could make the excuse of a pressing engagement, and he would not be lying. He had an urgent appointment with his own destiny. And there must be at least one ball and half a dozen parties of varying sorts to choose among for tomorrow evening, to all of which he would have been invited. There were always myriad entertainments every evening during the Season. He must simply make his choice and go. He was quite resigned to what his immediate future had in store for him. He had had enough time to think about it. His grandmother had talked openly about it at Christmastime. His mother had been hinting for at least the past year. He had been procrastinating. That must stop. He would persuade his grandfather to talk about his boyhood and young manhood today. The old, oft-repeated stories could sometimes be a little tedious to listen to, but Grandpapa enjoyed telling them and who knew when would be the last time Ralph would hear them? Was he ailing? Or could he go on as he was now for another ten years or so? The answer to that question, impossible to know, did not affect the central issue, though, did it? The duke had an heir, but that heir himself did not. And life, as Ralph’s grandmother had observed to him last evening, was always uncertain, even for the young. He could die at any moment. Indeed, there had been times when he had wanted to die and had even tried to help the process along… But he would not think of that. Now was the time to think of life. Though what sensible, feeling man would wish to be responsible for bringing yet another human being into this world? He shook his head. Such thinking was not to be allowed. He gazed at her without smiling. Had he asked for company? Did he look like the sort of man who would feel lonely and pathetic if left to stroll alone? But he looked at the trunk beneath his hand and up into the spreading branches when perhaps he ought to have ignored her question and her entirely. He looked back at her, all amazement again, and had to remind himself that she was not a servant. She was standing out in the sunshine, and the sunlight was gleaming off her hair and making it appear even more startlingly red than it had looked yesterday. Beneath the hair, she had the pale, delicate complexion that often went with red hair. And the freckles. She must have to be very careful about exposure to the sun. Her skin would burn horribly. Yet she was wearing no bonnet. But she had asked him a question—an impertinent, intrusively personal question. He answered it nevertheless. “And your dream was soon shattered,” she said softly. What did she know about it? He looked stonily at her before turning his head sharply away. Should he stride off toward the bank of the river and trust she would not come trotting after him to offer her company? Or should he stride back to the house and outpace her? He hesitated a moment too long. His eyes returned to hers. He removed his hand from the trunk and leaned his shoulder against it. She must think a gale was blowing. She had a death grip on the corners of her shawl. He crossed his arms over his chest and raised one eyebrow. Her impertinence knew no bounds. Though she was quite correct—she had not been eavesdropping. She had been in the drawing room by right. “I do not believe it is just your youth, is it?” she asked. He raised the other eyebrow to join the first. He felt a curious mixture of urges. One part of him wanted to bellow with laughter. Another part wanted to explode with fury. He had turned cold. It was still quite early morning, of course, and he was standing in the shade of the tree and away from what heat there was in the sun. But it was not that. It was not an outer coldness. He did not know why he was enduring this conversation. “I know by the tone of your voice that you agree with me,” she told him. “Probably not knowingly,” she said. Well, he thought irritably, it was nice to be known, to be understood. He wondered idly if anything ever shook her calm, if she ever lived up to the promise of that red hair. “You would do better to marry me,” she said. He stood where he was, his arms folded, his eyes riveted upon hers, unable to think of a blessed thing to say. “I have no interest in you, Miss Muirhead.” It was brutal. He felt savage—and cold to the heart. The hair was an illusion, he thought. She was as cold a fish as he had ever encountered. But being married to her would be the next best thing to remaining single. He could not remain single, however. He must marry. She was twenty-seven years old. She had grown past both youth and innocence. She had loved once. Did that mean…? “Are you a virgin, Miss Muirhead?” he asked. Again it was a brutal question. It was also an unnecessarily impertinent one. He was not seriously considering her outrageous proposal, was he? “Are you related to Graham Muirhead?” he asked her abruptly, à propos of nothing. “He is my brother,” she said. Ah. His eyes strayed to her hair and back to her green eyes. Graham was dark haired and dark eyed. It was hardly a recommendation that she was related to him. She must have read his thought.